Receive exclusive email updates on trail conditions and grooming. Enjoy three trail exchange weeks (ski for free!) with other cross country ski clubs in the region. Help to maintain our hard-working trail grooming equipment. Contribute to the insurance necessary to keep the trails in operation. $19 of the fees for each person go to Cross Country Ontario and Cross Country Canada who carry the insurance for the Owen Sound Cross Country Ski Club. Without this insurance we would not be able to use the Grey County and Grey Sauble Conservation properties. The remaining fees (for example $26 for a single adult) go to the club to pay for annual trail grooming costs such as gasoline, equipment maintenance, portable toilet rental and towards the future replacement of the grooming equipment. 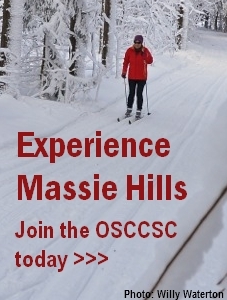 We are pleased to report that you can now register as an Owen Sound Cross Country Ski Club member in that new-fangled on-line way. Owen Sound Cross Country Ski Club Inc.
Once we receive your registration form and cheque we will send you out your button stickers or new buttons if you’re requesting them. As it costs much more to mail buttons than stickers we have a fee of $2 per button if you’re a returning member. Please be patient if you do not receive your buttons or stickers right away, as the membership forms pass through a few hands before the mailing happens. We also prefer to do them in batches so as to not make extra work for ourselves.